Any man who will spend a Saturday afternoon on his hands and knees, digging around the shelves of a musty, chock-full thrift shop is a hero. At least he’s my hero. In fact, I think it might make him a canonizable saint. A few weeks ago, I begged my husband to accompany me to “The Last Stop Shop,” an apostolate of the Sisters of St. Francis of Assisi. I was on a hunt for six unique china cup and saucer sets, and I needed his help – I’d been on the hunt for months; I had a special event planned for those cups, and my time was running out. I also needed Mark’s agility, since I have barely any of my own. You know the term “elephant in a china shop?” Well, that would be me. You don’t want me anywhere near china. In fact, you probably don’t want me near the “guaranteed to last a lifetime” dinnerware, either, because it won’t with me around. The Sisters frequently receive entire estates as donations, and I knew they had shelves upon shelves of lovely old dishes. I also knew better than to get too close to them. We were 84% successful, having found five of the six sets. I was excited and disappointed all at the same time. I wanted to perfectly pull off what I’d code-named “The Tea Cup Caper,” by presenting the cups to five women in my life who are vitally important to me. We’re not biologically related, although we may as well be, since we’re bound together for life as members of the same Association of the Christian Faithful. We’re members of the International Apostolic Federation of Schoenstatt Families, or Family Federation for short. We, along with our husbands, underwent a 10-year period of formation, the culmination of which is a lifetime consecration to the Blessed Virgin Mary and to each other, in terms of our fidelity to one another and to our common mission. All told, we’ve been together for 15 years. When we began our formation, we all lived in the same general proximity. Now, job relocations have taken two of us out of state; we see each other twice a year – once for a retreat and once for a community workshop, but it never seems enough. As our families have grown, their needs increased, and we’ve become a bit older and a bit slower, it’s become more and more difficult to keep up with the girl chat in which we so love to engage, even for those of us who still live in the area. This is something that men perhaps don’t understand, but we women certainly do. Just watch us anytime we get near one another; we can talk circles around the guys even without directly using words. I wanted the cups and saucers to be a symbolic representation of our unity through our Blessed Mother’s heart, in spite of our physical distance. When we sit down to have tea or coffee with her, we’re having tea or coffee with all of us, because spiritually, we can never be separated. Our annual workshop was fast approaching and without the sixth cup and saucer set, I figured The Tea Cup Caper would have to wait another year. As we were doing our frantic evening-before packing (also an annual event), my youngest son urged me to give the caper one more effort and try the thrift store down the road. Reluctantly, I went. I wasn’t very hopeful, though; this thrift store rarely had anything remotely like fine china, which is why I feel safe shopping there. I rushed over to the household section, all the way begging Our Lady to help me find (and not break) the last cup and saucer set. 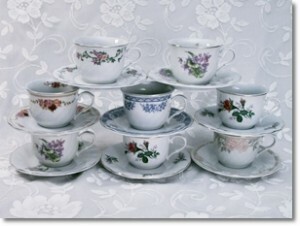 Amazingly, I spied a stack of beautiful chinaware – plates, bowls, sugar bowl, creamer, saucers…but no tea cups. Darn! I went through each row of cups, looking for one to match the lovely saucers, spouting prayers to the Blessed Mother as I searched. She’s a woman – of course she’d understand the urgency of the situation. My heart sank further with each row. I was about to give up. Then, I saw it. There at the very end of the row, was my prize. Eureka! The last cup in the last row matched. As I raced to pay for my treasure, the clerk chided me. “Where’d you get that cup?” she exclaimed. “Uh, over there,” I dumbly pointed to the shelves of dishes. I felt like a little kid who’d snitched the last chocolate chip cookie. “Uh, no,” I answered. I tightened my grasp on the cup and pulled it closer to me. I know I should have been more sympathetic toward her, but I had hunted too hard for too long and was not about to surrender set number six under any circumstances. She packed up my purchase, and I scurried home. I washed and assembled the sets on my kitchen counter. They were all so pretty, that I simply couldn’t decide which one to give to which lady! So, I let Mother Mary decide. I gently wrapped each set, being careful not to pay attention to which set went into which box. I wrote an anonymous note to each of us, put our names on the envelopes, mixed them around, blindly drew an envelope for each box, and taped it in place. The Tea Cup Caper was a success. We all were pleasantly surprised at the tea cup and saucer that had been chosen for us. Each one seemed to fit each personality, and I found it especially remarkable that the last tea cup I had discovered went to the woman who always puts herself last in lieu of other’s needs. The Blessed Mother did a far better job of matching the set to the individual than I ever could have. As I write, my tea cup and saucer sit gracefully on my desk top, filled with my favorite tea, a reminder of my sisters in Christ. Suddenly I’m there with them, chatting away, laughing, crying, listening and encouraging and knowing that we are united forever in the heart of the Blessed Virgin Mary. I only wonder why I didn’t pull The Tea Cup Caper sooner.